Hardly an American today escapes being polled or surveyed or sampled. In this illuminating history, Jean Converse shows how survey research came to be perhaps the single most important development in twentieth-century social science. Everyone interested in survey methods and public opinion, including social scientists in many fi elds, will find this volume a major resource.Converse traces the beginnings of survey research in the practical worlds of politics and business, where elite groups sought information so as to infl uence mass democratic publics and markets. During the Depression and World War II, the federal government played a major role in developing surveys on a national scale. In the 1940s certain key individuals with academic connections and experience in polling, business, or government research brought surveys into academic life. 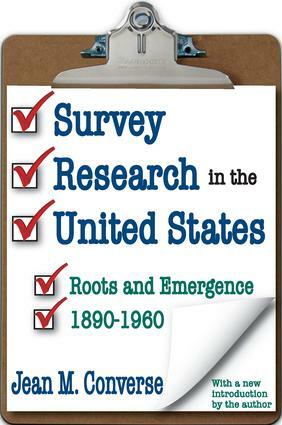 By the 1960s, what was initially viewed with suspicion had achieved a measure of scientific acceptance of survey research.The author draws upon a wealth of material in archives, interviews, and published work to trace the origins of the early organizations (the Bureau of Applied Social Research, the National Opinion Research Center, and the Survey Research Center of Michigan), and to capture the perspectives of front-line fi gures such as Paul Lazarsfeld, George Gallup, Elmo Roper, and Rensis Likert. She writes with sensitivity and style, revealing how academic survey research, along with its commercial and political cousins, came of age in the United States.